Variety isn’t just the spice of life, it’s the difference between a good shift and a great one. Most scrubs stop at solid colors, but Carhartt scrubs target the value in prints and flex fabrics. With Carhartt scrubs, you not only get variety in styles, you get choices of colors, prints and fabrics that fit your lifestyle. If you’re aiming for superior looks and feel, your search for the right scrubs stops here. Carhartt offers men’s and women’s tops that meet the mark of fashion and dependability. With great features like specialized pockets and loops for clipping your tools, you’ll find a top that meets every shift’s needs. The front patch pockets with the reinforced pen slot on the Men’s Multi-Pocket Ripstop Top are just one example of the utility you’ll find in Carhartt features. Reinforced threads and coordinating piping at the shoulders of the Men’s V-Neck Raglan Sleeve Top combine quality construction with good lines for a look that lasts. 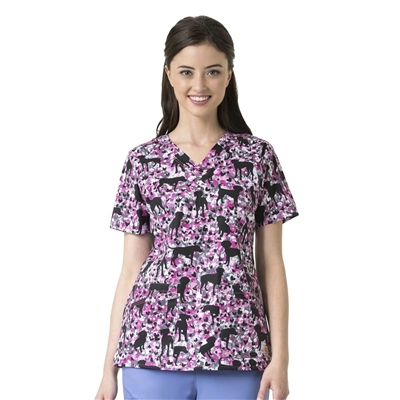 Carhartt’s line of women’s scrub tops is just as durable, but the scrubs are shaped to fit for a woman. 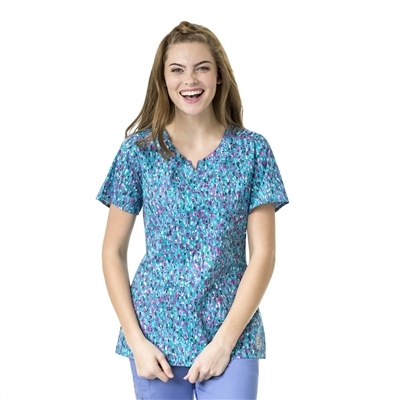 In addition to the seven styles of men’s scrub tops, Carhartt produces the same great features and more in multiple women’s styles. Check out the varieties you’ll find in solids and prints. Women’s V-Neck Multi-Pocket Top: Classic but not plain, this top comes in eight vibrant colors with an ID loop at the shoulder and pen pocket on the sleeve. There are also two roomy front pockets with pen slots. Rockwall Women’s Mock Wrap Notch Neck Top: The softer neckline on this top can still stand up to long shifts with FastDry technology for quick wicking and a stain-releasing fabric. Women’s Cross-Flex V-Neck Media Top: You’ll never be without your tunes with the built-in ear bud holder and double pocket at the sleeves. This top stretches with you and bounces back with its Rugged Flex stretch technology fabric and four front pockets, and is available in 20 colors. Women’s Cross-Flex Knit Mix Wrap Top: This top takes the mock wrap up a notch with knit back and side panels to provide increased flexibility. A logo D-ring at the waist and pockets at the sleeve and on the front create plenty of spaces to tuck your things. 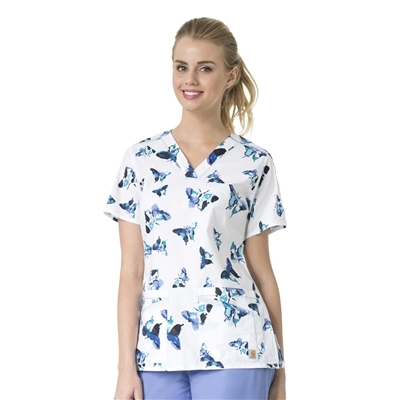 Women’s Cross-Flex Y-Neck Fashion Top: If the question is “Why not?” then this scrub top is the answer. Available in 20 brilliant colors, this neckline gives you a break from the V-neck while still providing you with the comfort and coverage you need. You’re always on the go during your shift, so you need scrub pants that can match your pace. Carhartt pants provide you with the fit you want and combine FastDry and Stain Breaker technology to wick away moisture and release stains so you can keep going all shift long. Ample storage in deep pockets makes it easy for you to stow whatever you need from room to room and floor to floor. In addition to the four styles for men, check out the variety of women’s styles Carhartt offers to complement each of your tops. Cross-Flex Knit Waist Cargo: A knit waistband supports this style with pockets galore, including a scissors pocket, two front and back pockets and a triple-cargo pocket. Rockwall Pull-On: A full elastic waistband and drawstring show only a sleek silhouette with this style. Rockwall Multi-Pocket Cargo: Back elastic and a full drawstring keep these pants in place. Cross-Flex Boot-Cut Utility Cargo Pant: All the utility of the straight leg cargo but in Carhartt’s Rugged Flex stretch fabric. Cross-Flex Flat Front Flare Leg Pant: If you want to add a little flair to your fashion, these flare leg pants will flatter and flex with your every move. Scrubs may be the basis of your workwear, but you may need to add a lab coat from time to time. Whether you’re a student in a short coat or a long-time veteran, Carhartt lab coats protect your scrubs and provide a professional look to every scrub setting. Each style offers multiple pockets for accessible storage options and lapels that lay down regardless of your movement. Unisex Poplin Student Lab Coat offers a three-button closure and three pockets. Unisex Consultation Lab Coat features an inner hip pocket, two lower hip pockets and two chest pockets. One chest pocket has a button closure flap. Unisex 5-Pocket Lab Coat offers a longer length with side hand openings to access pants pockets. Women’s Short Fashion Lab Coat features four pockets on the front and one inner hip pocket. Women’s Long Fashion Lab Coat falls below the hipline and features pin tuck pleated cuffs, center back waist elastic and a front waist belt. Men’s 6-Pocket Lab Coat includes a back waist belt, two-piece pleated sleeves and one inner chest pocket in addition to the stacked patch pockets and chest pockets on the front. No matter what look you’re aiming for, Carhartt scrubs can help you hit the mark. For even more selections, check out all of the Carhartt Collections today.